You’ve probably taken at least one NSAID (short for Non-Steroidal Anti-Inflammatory Drug): the family includes Aspirin and Ibuprofen, and all the store-brand generic versions that have the same active ingredients. Some people take them as part of an actual medical treatment plan for long-term heart health, but a lot of other people take them regularly for problems like muscle soreness after exercising or just general aches and pains. They’re incredibly popular, so it’s really a problem that they can be so damaging to the gut. NSAIDs can increase intestinal permeability, change the composition of the gut flora, and even cause more serious problems with long-term use. From a Paleo perspective, a much better solution is to treat the source of the pain and inflammation if possible, not just throw an anti-inflammatory at it and call it a day. But Isn’t Reducing Inflammation Good? In the Paleo world, there’s a pretty big focus on reducing inflammation, so “Non-Steroidal Anti-inflammatory drugs” sounds like a pretty Paleo-friendly medication. But actually the problem with inflammation isn’t the inflammation – it’s whatever is causing the inflammation. Inflammation is a perfectly healthy immune response to injury. If there’s a chronic low-grade injury response going on, the real question is why that response is being chronically activated. NSAIDs suppress the inflammation but they don’t actually address the underlying injury.And the way that they suppress inflammation is hard on the whole digestive system. They work by reducing the secretion of inflammatory prostaglandins, but prostaglandins actually have a protective effect in the gut and with lower levels of prostaglandins the gut is much more vulnerable to injury. NSAIDs increase gut permeability, modify the gut flora, and can even cause more serious problems like gastric ulcers and intestinal bleeding. One reason why inhibiting prostaglandin secretion is that increases the permeability of the gut lining. Intestinal permeability, also called “leaky gut,” basically refers to how much stuff is allowed to pass through the lining of the gut. That’s how nutrients get from the gut into the body, so everyone needs a certain amount of permeability. But there’s such a thing as too much, and if the lining of the gut is too permeable, it can let in undigested food components or other things that just shouldn’t be in the bloodstream. Intestinal permeability is a big player in autoimmune diseases, and potentially in other inflammatory diseases like diabetes; you can read more about it here. For NSAIDs specifically, this study found that even one 600mg dose of Aspirin was enough to increase intestinal permeability – that’s an important contrast to other risks like gastrointestinal bleeding or ulcers, which usually only show up after taking NSAIDs for a long time. This can also make any other gut damage worse. For example, this study looked at healthy athletes – an elite level of athletic training often causes gut damage from the stress. A lot of athletes also use NSAIDs to deal with muscle soreness and inflammation from working out hard without taking enough time to rest and recover. The researchers tested the athletes with 400mg of Ibuprofen (that’s 2 tablets, which is what most people usually take) and a cycling challenge. They found that the use of NSAIDs made the exercise-induced problems worse. That difference was big enough for the authors to conclude that ibuprofen has a significantly negative effect on the integrity of the gut barrier. This study looked at the effects of NSAIDs on the gut flora, not just the lining of the gut. People who regularly took NSAIDs had significant differences in the composition of the gut flora. The particular species differences depended on the particular NSAID and which other medicines the person was taking (for example, NSAIDs + proton pump inhibitors produced a different bacterial composition than NSAIDs alone). It’s not actually clear what the changes all mean – we don’t know much at all about what a “healthy” gut biome actually looks like, much less what individual changes might indicate – but it’s still concerning. In the long term (like for people who take low doses of aspirin to prevent cardiovascular problems), NSAIDs are also infamous for contributing to intestinal bleeding and ulcers – these are problems that can be serious or even life-threatening. 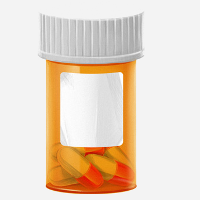 Chronic use of NSAIDs can seriously damage the lining of the stomach and the small intestine. This review discusses some of the key points about erosion of the intestinal wall and ulcers caused by low-dose aspirin in particular. 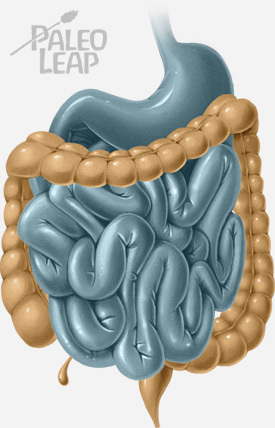 About 10% of people develop ulcers and over 60% get some kind of erosion of the intestinal wall. Most studies showed bleeding in 2-5% of cases. These are serious issues, especially since NSAIDs are so common. If you look at all the effects on the gut, not just intestinal bleeding and ulcers, NSAIDs start looking worse and worse. Reducing inflammation is important, but if that’s the goal, a better approach would be to actually address the problem causing the inflammation in the first place, rather than suppressing it with drugs that have such significant side effects. Is it muscle soreness from overtraining? Rest. Is it gut inflammation from an overload of omega-6 fats? Replace industrial seed oils with healthier cooking fats like olive oil. Of course, there’s a time and a place for painkillers, and there’s research being done into NSAIDs that don’t harm the gut so badly. Needless to say, Paleo Leap is not a doctor and if a doctor prescribes you a medicine, don’t stop taking it on the advice of a stranger on the internet. But from a Paleo perspective, NSAIDs just aren’t a solution to chronic inflammation. They shouldn’t be a band-aid slapped on an inflammatory diet or a training schedule that doesn’t leave your body time to recover, especially not if the side effects can be that serious.